Order in next 14 hours and 24 minutes for despatch today. 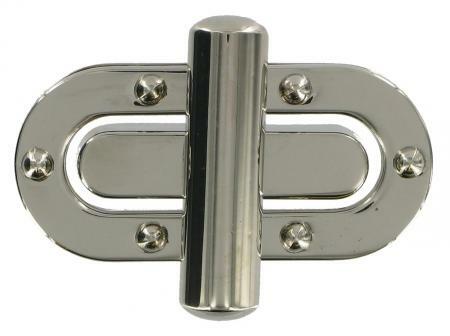 This replacement Turn Clasp is used with flap over handbags and briefcases. It is available in Nickel as shown. The approximate dimensions of the largest part of the clasp are 75mm x 34mm. Supplied with screw on back plate. This range of replacement parts is useful for practically minded people, who have a broken handbag or briefcase they do not want to part with and who do not have a saddler or luggage repairer in their neighbourhood. Step 1 Check that the back plate is compatible with the existing front plate. Step 2 We would unstitch a seam and fix the plate but you might find it easier to cut the lining. This can be very neat if executed correctly. Step 3 Once you have made a neat cut inside the lining, you will probably see the patch that covers the back of the catch, peel this off. Step 4 The next step is to lift the legs of the broken clasp (sometimes there are screws instead. Take the backplate off and release the broken clasp. Step 4 Once the old clasp is off, offer the new one up and mark the holes required for the spikes on the front panel. If you are happy with the position, make the holes (I use a small blade) and push the new clasp on. Step 4 Put the backplate on (I have pushed the spikes right through the lining and held it all in place with the back plate but its your choice) and bend the spikes over, to trap the backplate (and possibly lining) in position.